Ramsey Creek is a fine home woodworking and renovations company that focuses on expert design services and handcrafted interiors. After Creative Mellen refreshed their identity, Ramsey Creek was in need of new print materials that reflected their high-end brand in both sophistication and quality. Ramsey Creek has decades of experience designing and constructing award-winning, fine home projects throughout eastern Iowa. 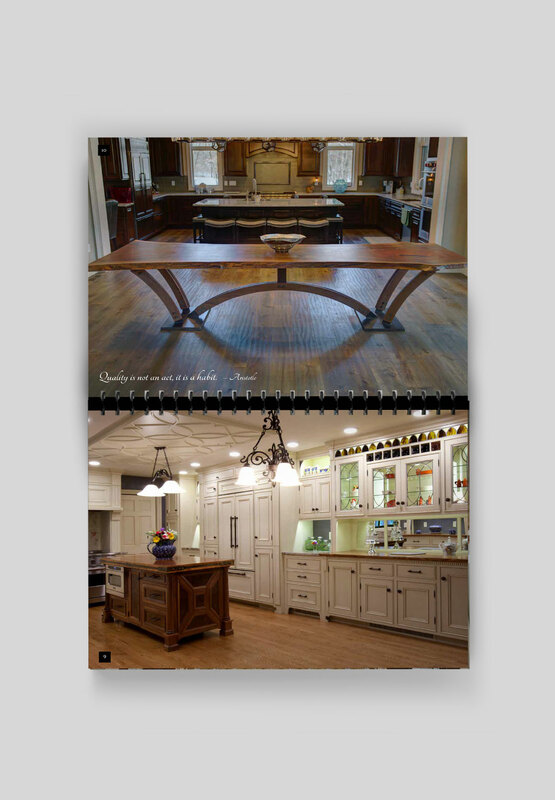 Their skilled artisans envision and create elegant objects to last for generations—whether it’s handcrafted cabinetry, custom woodworking, fine home remodeling, or new home construction. Our goal was to set Ramsey Creek apart by highlighting their expert design services, client-focused service, accomplished craftsmen, and top-quality materials used in their handcrafted, built-to-order projects. Developing a subtle, yet sophisticated, black woodgrain became the foundation for their printed materials. This unique look created a sense of luxury while allowing imagery and content to pop off the page. We used high-gloss paper, silver highlights, and rich photography to further enhance the brand. A custom spiral portfolio helps highlight projects through each year and is easily updated for builders depending on style and need. These elements—whether on a business card, company vehicle, or portfolio—allow for the brand to feature the qualities of their work.